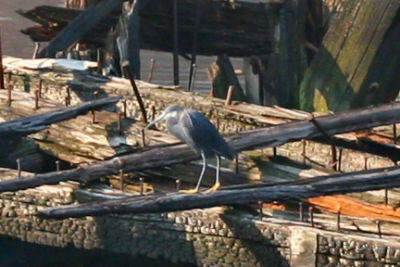 Since last Sunday a rare-for-North America Western Reef Heron has been alternately frustrating and rewarding birders from the Empire State and beyond as it appears and disappears from an unassuming stretch of waterfront property in the borough of Brooklyn, New York City. 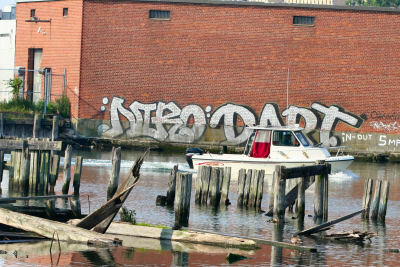 It was back again today and I was in the neighboring borough of Queens so of course I went off on the hunt. Actually, I would never have thought to go after the bird, as it had last been seen in Brooklyn on Wednesday, if not for Jory, may he see all 10,000 Birds, who was kind enough to call me just after 7 AM to give me the heads up that it had just been resighted. He’s just lucky Daisy and I were already awake or she might have hunted him down and done him unspeakable harm for calling so early on a Sunday. 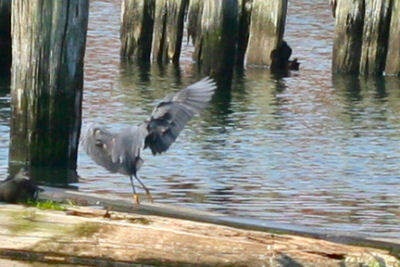 The bird was very active, flying from perch to perch, harassing a Double-crested Cormorant, and preening. It was fun and exciting to watch: it was also fun to see the delighted expressions on other birders’ faces as they showed up and got their first looks. But it turned out that it was just moving around a bend into the cove and it settled on another pile of decrepit logs, possibly the remains of a pier or barge. 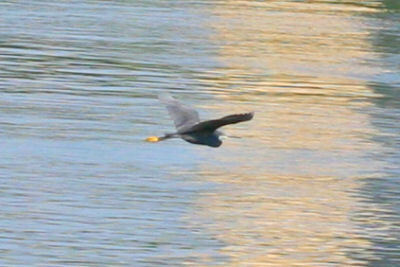 That was enough for me: I headed back upstate and was glad to get a call from Jory to let me know he had arrived in Brooklyn to see the Western Reef Heron before it pulled its disappearing act again…and he also got out to Jones Beach to see the Yellow-headed Blackbird that is still present so I think we’re even! Now the big questions out there are is the Brooklyn bird the same as the one that was in Maine and New Hampshire last year? If so, where did it winter? And what’s the deal with the taxonomy of this species? And am I ever glad that I got to see this bird. It just wouldn’t be right for 10,000 Birds, with two New York-based birders, to miss this one after a New Jerseyan got it. You are now the second person to call when while viewing this bird… Curse all of you!!! As I’ve said before, you will all be sorry when this species gets lumped with Snowy Egret and you will all have delete one bird off your life (and year) lists. (better get at least 301 just to be safe). Touche! I am glad you got to see it. Will is probably right and he’ll get the last laugh. Very cool for sure and congrats finding it! Way to represent, Corey! The short lens did a great job.